2 drawings on paper, laminated (1 sheet) : ink ; top image 3.875 x 5 in., bottom image 3.875 x 5 in., on sheet 9.5 x 6 in. 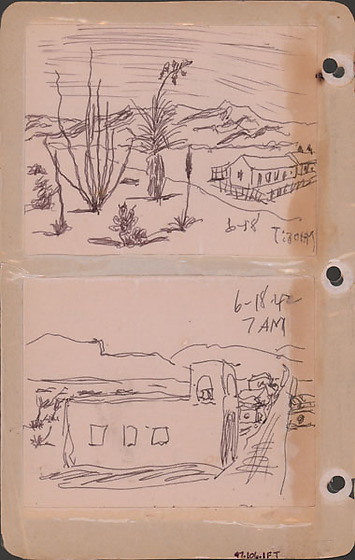 Ink sketches of desert town landscapes on June 18, 1942 at 7:30AM and 7AM. Top sketch of a fenced one-story building on right edge. Widely spaced plants in foreground ; mountain range in background. Drawing is on a small sheet glued to larger sheet. Bottom sketch down the main street of a town lined with buildings receding into the distance on right. Large building, probably a church, with a small tower facing street. Mountains in background. Drawing is on a small sheet glued to larger sheet. Drawing 97.106.1FS on recto of same sheet. Written in black ink on top image, bottom left: 6-18-42 / 7:30AM. Written in black ink on bottom image, top right: 6-18-42 / 7AM.